Experience an unforgettable journey through one of the best wildlife safari regions in the world. In Tanzania, adventure on game drives in Tarangire National Park to spot giraffes, leopards, and cheetahs. Fly to Ngorongoro Crater, its volcanic walls sheltering black rhinos, giant elephants and black-maned lions. Next, relish 3 nights in vast Serengeti National Park to witness thousands of wildebeest on their natural migration. Then, venture into Kenya’s incomparable Masai Mara, acres of fabled African grasslands dotted with acacia trees. Explore this exciting wilderness by 4x4 and on foot, and meet a Masai tribe. And do it all in style, flying directly between magnificent game reserves, luxury lodges and tented camps. Upon arrival in Tanzania, you are escorted to your deluxe hotel in Arusha. The remainder of the day is at your leisure, allowing time for a tour of this historic colonial lodge. Day 2, enjoy a morning tour of Tanzania’s largest coffee plantation, then lunch in the lodge gardens before your flight into Tarangire National Park. You are met by the Tarangire Treetops team, and taken on your first game drive. 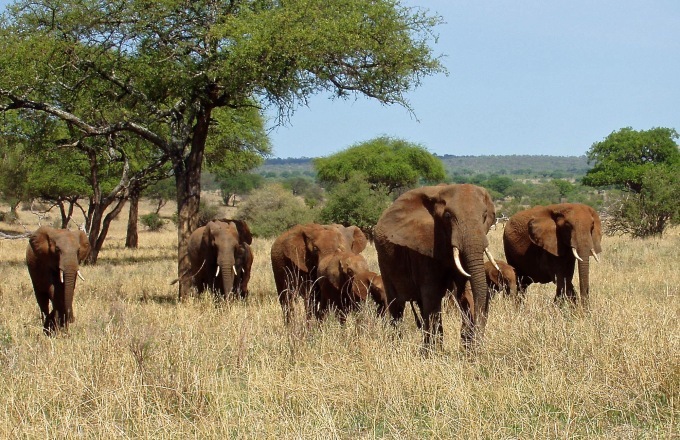 Tarangire National Park covers more than 1,000 square miles that teems with wildlife throughout the year; and during the dry season (June – October), the migrating populations are exceptionally dense. Watch for leopard, lion, cheetah, buffalo and elephants - Tarangire is home to some of the largest herds of elephant in Africa. On Day 3, enjoy your choice of activities, including morning and afternoon game drives, off-road adventures, and special night drives. Take a game-walk with a naturalist guide to get an up-close of the resident wildlife, and visit an authentic Masai village. Each evening, relax over sundowners at your luxury camp. Day 4, enjoy a morning game drive and picnic lunch before your direct flight to Manyara in the Ngorongoro Highlands. You are met by staff from The Manor at Ngorongoro, and arrive in time for high-tea at this elegantly restored German-Dutch farm home. The legendary Ngorongoro Crater is a caldera 12 miles across, ringed by an amphitheater of steep 1,640-foot-high walls, and is known for the variety and abundance of its wildlife species. On Day 5, descend to the crater floor on a guided exploration of this vast intact ecosystem and its residents, including giant-tusked elephant, black-maned lions, leopard, and some of Africa’s last black rhino – the Ngorongoro Crater is home to more than 30,000 wild animals. Enjoy a picnic lunch on the crater floor, followed by more game viewing. Relax the morning of Day 6, or go horseback riding, cycling, take an estate tour or a spa treatment, or perhaps a visit to Lake Manyara National Park. This afternoon, fly direct to the Serengeti. You are met, then escorted on an exhilarating afternoon game drive before arriving at your luxury tented camp. Set deep in the heart of Masai territory, the Serengeti is the scene of the greatest wildlife migration on earth. It is a magnificent vast wilderness of endless acacia-dotted grasslands, where large predators battle for supremacy with millions of herbivores as their quarry. Spend two days on action-packed game drives that reveal incredible wildlife. Watch as black-maned lion, cheetahs and hyenas claim their prey from the millions of wildebeests, zebra, giraffe and gazelle. Guided game walks take you along the woodland banks of the Great Grumeti River to view crocodiles, hippos, and Colobus monkeys, as well as some superb bird life. And relax each evening over sundowners and a gourmet dinner. Day 9, enjoy an early morning game exploration before your flight to Tarime. You are met and chauffeured into Kenya, then board a flight into the Masai Mara, set in the heart of Africa’s Great Plains. Upon arrival, you are escorted to your luxury camp inside the Masai Mara National Reserve. Enjoy lunch before adventuring on a late afternoon game drive. The Masai Mara boasts 650 sq. miles of unspoiled wilderness – with views across rolling golden grasslands studded with acacia trees, rivers and forests. Enjoy two unforgettable days of 4WD and walking safaris through these plains rich with flora and fauna, including the Big Five. Spot lion, leopard, cheetah and hyena, as well herds of wildebeest, gazelle, buffalo, elephant, and more than 300 bird species. Enjoy other included activities, such as a cultural visit to the Masai village to learn about their traditional ways and meet Masai warriors, visiting a local school, and guided nature walks. One morning, depart the lodge early for a sunrise hot air balloon flight over the expansive plains, followed by a champagne breakfast in the bush. Each evening enjoy cocktails while watching the sun set over the Masai Mara. Enjoy your last the morning of Day 12, before flying to Nairobi. You are met upon arrival, and escorted to the beautiful Hemmingway's Nairobi Hotel. The remainder of the day is at leisure to relax in this beautiful setting. Day 13,you are at leisure until your transfer to the airport for your departing flight. Arusha Coffee Lodge lies cradled in the endless acres of Tanzania's largest coffee plantation. This exclusive, boutique hotel lodge has been designed to recall the farms' original plantation homes, radiating the warmth and invitation of the old colonial plantation homes historically distinctive to the coffee plantations. The property also features a swimming pool, restaurant, lounge and laundry service. Amenities include a mini-bar, ceiling fan, safe, hairdryer, and a coffee grinder and percolator to offer a true coffee estate experience. Tarangire Treetops sits serenely on the border of the Tarangire National Park. Each of Treetops' elevated rooms boast one of the largest bedrooms to be found in any camp or lodge in East Africa – and all with an exotic double shower en suite bathroom. With furnishings that create warmth and demonstrate a commitment to local craftsmanship, the ‘up-in-the-air’ experience is completed by the open-fronted room design affording views across the Tarangire plains from an expansive but private balcony. Reminiscent of an elegant up-country farm home in the Cape Dutch style of architecture, the Manor at Ngorongoro is a total restoration of one of the first German-Dutch settler farm homes in the Ngorongoro Highlands. The Manor is a 1,500 acre Shangri-La Estate, located adjacent to the Ngorongoro Conservation Area. With panoramic views, there are guest areas with fire pits, a lounge and bar area, access to outdoor decks and a choice of formal or casual dining areas. The lodge also offers a swimming pool, steam & sauna room, bar & wine cellar and a library with internet access. All the 20 luxurious guest cottage suites are enveloped by lush gardens and ancient trees, offering a luxury safari experience fusing East African safari hospitality with old world Afro-European architecture and décor. Cottage amenities include a private courtyard & deck, ensuite bathroom with a bathtub and rain shower, a hairdryer, a fireplace and fantastic views of the surrounding landscape. Hidden among the rocky outcrops or kopjes of the vast Serengeti plains, this camp exudes decadence reminiscent of old Africa. The split level lounge, cigar bar, restaurant, sundecks and swimming pool are perched among the outcrops and overlook the vast and rugged landscapes that are home to the world's greatest mammal migration. The Sunset Deck - a vast wooden deck, with a fireplace and a number of directors' chairs - is a popular evening gathering place to watch the sunset over the Lobo River, whilst enjoying a drink from the bar. There is also laundry service. Set along a stone pathway is the dining area, which like the lounge has a total open front, with views across the river. Breakfast is an extensive spread with fresh bread, cereal, yogurt and fruit. There is also a cooked breakfast option. Take along a tasty packed lunch to eat whilst you are out in the bush, or come back to the camp for the buffet style spread. For dinner the He camp restaurant offers elegant and inventive dishes. Twenty large and spacious tents have been carefully placed to provide privacy and blend into nature's architecture, overlooking the Grumeti River and its resident hippos. Surrounded by a 360-degree verandah deck, with a specious 480 sq. feet of internal floor space, each sits on a raised wooden platform with wooden doors, part stone and part canvas walls and a canvas roof. The en-suite bathrooms sit behind canvas curtains to one side of the bedroom. Here you will find a beautiful dark wooden surface, into which twin his-and-hers sinks are set. The sinks are beautifully crafted pottery in a dark glaze with a metallic quality to it. Above the sinks hang his-and-hers mirrors. To one side of the sinks, behind a small dividing wall is a proper flush-toilet, and to the other is a hot-and-cold shower. A hair dryer is also provided. Located on the banks of a river from which it has taken its name, Sand River Masai Mara is located within the Masai Mara National Reserve, close to the Tanzanian border. Situated on a secluded and picturesque site, Sand River Masai Mara replicates the heyday of exclusive permanent tented camps of the late 1920’s. The interior fixtures and furnishings mirror this period perfectly, reminding all who visit of those countless Hollywood movies that have paid homage to a classic era of African adventure. Sand River Masai Mara is an ideal destination at any time of the year for those wishing to enjoy exceptional game-viewing. The National Reserve is best known for its large concentrations of big cats, such as leopard, cheetah and, of course, lion. Even the dramatic arrival of the Annual Migration merely adds to an already abundant resident wildlife that awaits discovery. This new boutique hotel, only a 40-minute drive away from Nairobi’s international airport, will elevate the standard of luxury service for travelers in the region. Magnificent in its symmetry and beautifully flooded with natural light, this plantation-style hotel will surely leave a lasting impression for all who visit. Beyond the balustrade of your private balcony, overlooking the iconic silhouette of the Ngong Hills, a breathtaking view of The Green Hills of Africa, as described in Hemingway’s novel, awaits you.